How can I apologise enough? 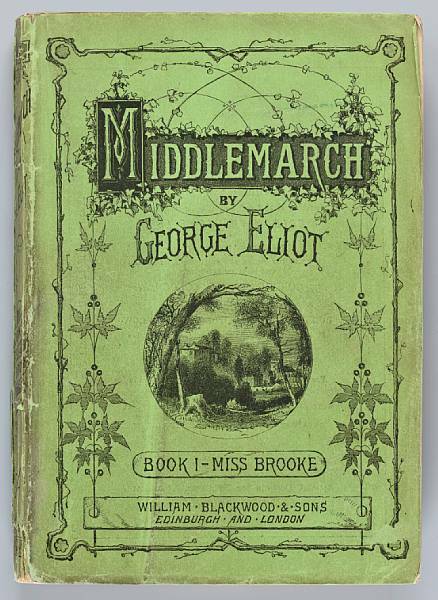 It's Wednesday, mid-week, Halloween and the prime slot on the blog for a great reading suggestion about pumpkins or something and what do I have to do? I have to tell you about another fishing book that's what. 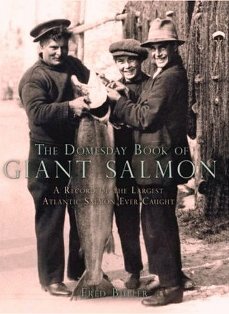 This however isn't just any old fishing book, oh no, excuse me, this is The Domesday Book of Giant Salmon by Fred Buller, published by Constable and Robinson. Secretly,I can't tell you how relieved I am that this one is finally netted and landed safely between two covers, because for the best part of the last two years a great deal of it has been spread across my kitchen table. Bookhound has been working hard with Fred to get forty years of research verified and in the bag and researchers I am told are the invisible people behind the scenes who must not be mentioned. Except I think Bookhound deserves a little mention because I know how hard he's worked on this and actually so have I by osmosis. In fact I know as much about these fish as anyone. Reflect that I have taken note of the women as the months have gone by because they seem to be quite good at this big fish thing and there is actually evidence to prove it.The other 480 pages do however seem to concentrate on the men so we must assume they have more time to go fishing. The book is gloriously presented and illustrated and there is pride bursting and abounding over it all, the cover is a favourite because that was a salmon we discovered in the museum over at Topsham. 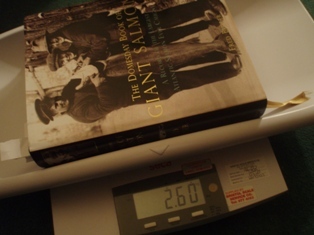 Lest there be any doubt about the weight of this giant tome I did happen to have some scales to hand and therefore could check it for accuracy and can report that it weighs in at a mighty 2.6kgs and I have photographed it for verification. Not exactly a stocking-filler, but I bet any fishermen out there would be thrilled to find this in his waders at Christmas.